Large-scale production of nanomaterials and fine materials has always been difficult for businesses. Hence, in order to deal with this problem, the U.S. Department of Energy’s (DOE) Argonne National Laboratory—an established leader in chemical process scale-up research for state-of-the-art materials—has recently invested in novel capabilities. The technology, called continuous flow reactors (CFR), can significantly enhance the efficiency and consistency of producing the materials employed in many different applications. In present fine-materials manufacturing setting, chemical producers mainly depend on batch reaction processes that produce industrial chemicals in tanks, which are heated to a predetermined temperature. After the process is over, the reaction needs to halt to empty the tank and replenish the precursors. However, this step involves plenty of starting and stopping that are not only inefficient but also labor-intensive, and this can also lead to inconsistencies from one batch to another that are not satisfactory in a production setting. On the other hand, batch-to-batch inconsistencies are fully eliminated by CFR processing. The same process parameters are used to manufacture the material continuously in the same reactor. Furthermore, it is not necessary to halt the process to empty and charge the reaction vessel again. The quantity of material produced depends on the time and the rate of flow at which the continuous process is run, and not on the number of batches and the size of the tank. Beyond the consistency improvements, CFR can streamline production of fine chemicals by permitting rapid optimization of process parameters such as temperature, flow rates, ratio of reagents and other parameters. While CFR can’t be used for all chemical production processes, it’s well suited to producing not only fine organic materials such as advanced electrolyte additives, but also materials such as catalysts and nanoparticles. Because the microfluidic plates used for chemical reactions are transparent, we can see into the reaction process as it occurs using tools such as the high-energy X-ray beams at the Advanced Photon Source, a DOEOffice of Science User Facility at Argonne, in order to understand what’s happening at incredibly fine time and resolution scales, which is particularly important for understanding processes governing nanosized material production. Kris Pupek, Principal Investigator, Argonne National Laboratory. The CFR program is based at Materials Engineering Research Facility (MERF) of Argonne National Laboratory outside Chicago. At the MERF, investigators can apply the CFR capabilities of Argonne to create samples at pre-pilot-scale rates of around 100 g of a single material. According to Pupek, the team will be able to generate specifications for highly efficient, custom microfluidic plates that are adapted to run particular chemistry. These custom-made microfluidic reactors can be used for the majority of commercially available CFR systems. It is also believed that the program will develop highly customized processes with the help of Argonne-designed systems that are not commercially available at present. A variety of research requirements are supported by Argonne’s world-class in-situ characterization, diagnostics, scale-up technology, computer modeling, and know-how in chemicals and materials sciences. Collectively, these capabilities allow the MERF to look for advances in process research and engineering developments advances that may not be feasible in other environments, which is the main force behind the Manufacturing Science and Engineering initiative of the laboratory. Even though CFR facilities are located at other U.S. locations, Argonne is one among the first institutions in the U.S. to provide detailed concurrent in-situ and operando characterization, optimization capabilities, and simulation modeling to support process innovations. One such detail is Pupek’s association with computing scientists to devise novel algorithms for improved optimization of materials synthesized through the CFR technology. The CFR setup at MERF is ideally suited for using active learning and optimization techniques to automate the navigation of the large parameter space and to deliver targeted nanoparticle properties. Stefan Wild, Computational Mathematician, Argonne National Laboratory. Argonne is dedicated towards developing sophisticated manufacturing materials, for example, materials that have advanced properties, and also developing more energy-efficient manufacturing processes. The CFR study was partly funded by nearly $1 million in Laboratory-Directed Research and Development funds for Manufacturing Science and Engineering. 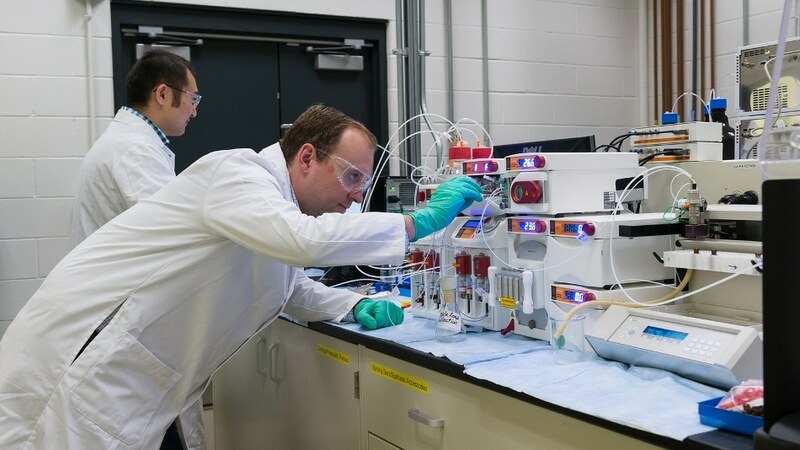 The U.S. Department of Energy, Office of Energy Efficiency and Renewable Energy, Vehicle Technologies Office, and Argonne’s Laboratory-Directed Research and Development funding program funded the development of Argonne’s Continuous Flow Reactor research program and facility.